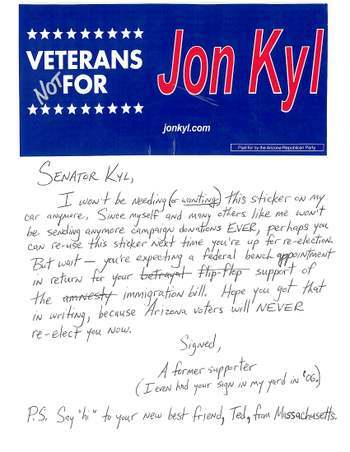 I just received this excuse letter from Senator Jon Kyl. Read it carefully...it seems he gets what Americans want, yet voted for the opposite. My message to Senator Kyl and every Senator that voted for cloture today: You're right about one thing. This amnesty bill was definitely a compromise...a compromise of our national security, not to mention our core values. UNACCEPTABLE. The Senate voted this morning against invoking cloture on the immigration reform bill, taking the issue off of the Senate’s calendar for the time being. While there is still a chance that a reform bill could be resurrected, the legislative schedule for the remainder of the year is such that significant immigration reform is unlikely to be considered again in the near future. The result of the cloture vote demonstrates just how difficult it is to achieve the consensus necessary to overhaul the nation’s immigration laws. The bill before the Senate had something for everyone to love, and hate. For conservatives, the bill included unprecedented additional resources to help secure the border (including the dollars upfront to pay for them), an end to chain migration, an effective employee verification system to prevent illegal immigrants from gaining employment, and a temporary worker program that is truly temporary. For liberals, it offered a way to deal with illegal immigrants who are already here, though the automatic pathway to citizenship they wanted was eliminated. To get something done, both sides had to make concessions. Considering that Republicans are in the minority, I believe we won far more than we gave up. I’ve linked to an editorial from the Washington Post that illustrates how the liberal media and Democrat politicians scorn the bill’s strong enforcement bent and the common-sense amendments some of us offered. Nevertheless, Senators from both the right and the left ends of each party united to block the bill’s further consideration. It was a case of letting the pursuit of the perfect become the enemy of the good. Many people have rightfully criticized the federal government for failing in the past to enforce the law and deal effectively with the problem of illegal immigration. I agree with them. And they understandably look skeptically on our current efforts to strengthen the law, even while they demand that Congress act. But we will never be able to solve the problem by saying “no” to new legislation because of past failures. And we cannot simply say “enforce the law.” As I’ve said before, much of the current law is unenforceable. The Senate’s vote today regrettably means the status quo will continue, with thousands of illegal immigrants continuing to pour across our borders every day and millions who are already here continuing to receive silent amnesty. Senators have been listening to their constituents around the country – the number of calls, letters, faxes, and emails has been unprecedented, even jamming phone lines into the Senate earlier today. I, for one, have tried to turn constructive suggestions into meaningful amendments to enhance the enforcement provisions of the bill. Though the current legislation has been defeated, I’ll keep fighting for additional resources in upcoming appropriations bills for more Border Patrol agents, the construction of border fencing and other barriers, and improved technology along the border. I will urge the Bush administration to enforce those parts of the law that are enforceable in order to demonstrate to a skeptical public that our government is indeed committed to enforcing the law. I also intend to introduce legislation that will focus on enforcing immigration laws at the workplace and securing the border. Clearly, the American people want more enforcement before doing anything else. I’ll continue to listen, and I invite your comments, suggestions, and criticisms. Thank you. So, he realizes the American people want enforcement first, AND he understands we want enforcement first because we don't trust the government to do any enforcement otherwise (like in the past)...yet he voted against what he knows his constituents want. He says much of the current law is unenforceable. So we do NO ENFORCEMENT? Hey Senator Kyl, guess what? Many parts of the current law ARE enforceable - so let's start enforcing. And how about that fence that was already approved - where is it? SHOW ME THE FENCE! Senator Kyl says, "we can't simply say 'enforce the law'." Why not Senator? Aren't laws intended to be enforced? I'm so sick of hearing "we can't" and "it's the best we can do". Then move aside and make room for someone who CAN and WILL get the job done. Senator Kyl says, "It was a case of letting the pursuit of the perfect become the enemy of the good." Is he smoking crack? They weren't pursuing anything close to perfection and passage of this bill, not defeat, would have been the "enemy of the good". This Senator aknowledges "the number of calls, letters, faxes, and emails has been unprecedented, even jamming phone lines into the Senate...", yet he refused to listen to the messages being sent by his constituents. Either he's deaf, hard-headed or just plain doesn't care what his constituents want. Senator Kyl says, "we will never be able to solve the problem by saying “no” to new legislation because of past failures." Well we'll never solve any probelms by REPEATING past failures either. Are our elected officials really too stupid to learn from past mistakes? The Washington Post editorial referenced is such B.S. that I excluded the link. This Senator is just truly clueless. Apparently, Washington will do that to you after awhile. Perhaps it's time to re-examine term limits? The best news I've received all week: The traitors were defeated! However, I must also say that I'm especially ashamed today, since both of my Arizona Senators betrayed their constituents by voting for amnesty. But no worries, we'll be sure to remind them of their betrayal when they're up for re-relection. I predict both Senator McCain and Senator Kyl are serving their LAST term as an Arizona Senator. Here's a list of all 18 Senators who changed their amnesty vote from 'YES' to 'NO', along with a list of all 53 Senators who voted 'NO' on amnesty today. I guess all those faxes, emails and phone calls I made weren't a waste of time afterall! Kudos to EVERY AMERICAN who voiced their opinion and defeated this bill. Dear President Bush & Congress: It's the Border, STUPID! The past few weeks has been an enormous wake up call to Americans everywhere. As a result of the immigration amnesty battle in Washington, Americans now realize that politicians cannot be trusted...PERIOD. If we take our eyes off them even for a second, the Kennedy crowd starts looking for ways to screw hard-working Americans. And even more disturbing, our so-called "Conservative" Senators jumped right on the immigration bandwagon along with the Dumbocrats. Here's a link to the names, addresses, phone numbers and fax numbers of several US Senators. These Senators NEED to hear from you - tell them what you think about their 'Shamnesty' bill. Below is the letter I faxed to most of them (I also faxed a second page containing only a huge "A" for Amnesty!) I feel so much better now...you should try it! 2. While even legalized ‘illegals’ will NOT be eligible to vote for many years, angry Americans WILL BE VOTING AGAINST Amnesty supporters in huge numbers. All those Americans who called, emailed and faxed your office will be voicing their discontent in the form of a vote for many elections to come. 3. Ask Senator Kennedy how many FAILED AMNESTY bills he’s helped author to date. With his track record on amnesty, he shouldn’t even be allowed in the room while an immigration bill is being written. 4. Also please ask Senator Kennedy how much our taxes will have to go up to pay for this and how much social security and medicare benefits will have to decrease. Certainly a responsible politician would NOT propose a bill that will cost Americans TRILLIONS of dollars without first knowing where the money’s coming from. But wait, nobody thought of that...of course, why worry about how much of OTHER PEOPLE’S MONEY YOU’RE SPENDING? Americans struggling to make ends meet can’t go shopping without making sure we have money in the bank first. Yet Congress wants to import tens of millions of welfare recipients without giving any thought to how they will pay for it because it’s NOT THEIR MONEY. 5. WHERE’S THE FENCE that was already approved? There isn’t one yet - that’s exactly why Americans do NOT believe you will secure the border even with amnesty. We are tired of being LIED TO...PROVE YOU CAN & WILL SECURE THE BORDER, and maybe Americans will be willing to swallow the amnesty pill. But NOT until AFTER the border is PROVEN to be secured because we’ve been tricked into amnesty before. 6. If you’re lucky enough to be one of the very few who supports amnesty and doesn’t get voted out of office next time you’re up for re-election, have you thought about what you’ll tell your constituents NEXT time the government considers amnesty for the millions of illegals who are encouraged by the passage of this Amnesty bill to illegally cross our still unsecured border in the future? 7. Time will prove this amnesty bill to be a lie. Time will prove that the government still has no intention of securing the border. All who support this bill will be considered liars and traitors by their constituents...actually, I think sell-out is the most common term I’ve heard used. Perhaps you too will feel betrayed by your colleagues who convinced you that the border REALLY will be secured this time if you just give amnesty first. Yet still, you’ll be looking for a new job. But you still have a chance to do the right thing... Don’t be naive - OPPOSE AMNESTY or look for a new job. SECURE OUR BORDERS NOW, then we’ll talk about amnesty. Who's on First - the new version! George: Will you, or will you not, tell me the name of the new leader of China? George: Yassir? Yassir Arafat is in China? I thought he's dead in the Middle East. George: Look Condi. I need to know the name of the new leader of China. Get me the Secretary General of the U.N. on the phone. George: All right! With cream and two sugars. President Bush, Have You Forgotten? I added the song, "Have You Forgotten" by Darryl Worley to the right sidebar. It will automatically play each time you come to this site, and it will continue to play over and over unless you stop it! I apologize in advance if you don't like country. But in light of the UAE port security ordeal, I think it's appropriate to remind a few folks about why border security is important. Whether it's the southern border with Mexico, the northern border or our port security. 9/11 happened because there are people who hate us and our way of life. They still do. Never forget. I've had this domain for a while now and have been toying with the idea of setting up a political blog. I have several business blogs, unfortunately I can't vent my political feelings on those blogs (bad for business since roughly half the country is going to disagree with just about anything I say!). But I keep up on current events quite a bit (okay, I admit I'm a Fox News junkie), and I have a lot of opinions that my family is probably sick of hearing. So finally today, thanks to George Bush's stupid idea to trust the UAE with some of our port security, I started www.BlogForFreedom.com to let the world know exactly what I think (although the world really doesn't care - I'm aware!). As a disabled veteran, a Republican and a President Bush supporter, I cannot believe that ANY of our nation's port security would be left to the UAE. I realize there is a great deal more to this issue than meets the eye - information that citizens such as myself do not have. However, if there is even a .01% chance that this could jeopardize national security (and there is at least a .01% chance), why would we take such an unnecessary risk? As a child, I lived in Saudi Arabia and I have many Arab friends. As a result, I understand their culture and I do not trust the UAE. I know that extremist Arabs who hate America are an accepted part of most Arab cultures. They are not seen as criminals, in fact, many see them as heroes and their ties to the "government elites" are usually strong. While many Arab governments are "officially" allies of the US and the war on terror, their people truly do not like America or our way of life. For this reason, it would be way too easy for an extremist group to find an "in" to this UAE company. What if our UAE 'friends' just happen to turn a blind eye to a shipment of weapons, nuclear, chemical or other hazardous items that could be used to launch an attack on our homeland? Currently, the majority of containers that come through our ports go unchecked and we need to tighten port security. Instead, we seem to be putting the fox in charge of the hen house. Has our government become completely blind to the obvious? President Bush and the Republican Party claim that securing our nation is a top priority after 9/11. Iraq is part of this plan and I support the war in Iraq. However, what good does it do to spend billions of dollars fighting terrorism in Iraq when our borders are completely unprotected? If Mexican immigrants can illegally enter our country any time they like, what's stopping Al Quaeda? Nothing. And now we're going to leave our ports in the hands of a country that was home to two of the 9/11 hijackers? If we continue with such an ignorant, liberal attitude towards national security, President Bush is right about one thing...it's just a matter of time before we get hit again. I have lost a great deal of respect for President Bush due to his failure to secure the Mexican border. I live in Arizona and I believed border security would finally be taken seriously after 9/11. But it was all political BS. And now with this port security issue, I don't know what he's thinking anymore. For the first time in my life, I actually agree with the Democratic leadership. If the Republicans want to continue being seen as the party that will protect America, they need to get back to basics and realize that putting a country that doesn't like us in charge of our port security is the wrong thing to do. It's like the UN putting Libya on the committee that oversees human rights. It makes ZERO sense. If Republicans cannot use their majority in Washington to stop this UAE deal, then perhaps they don't deserve to be in control anymore. I think this could be one of THE ISSUES that alot of people who are on the fence will remember. They could very well use their vote in future elections to punish candidates that support this UAE company. I don't know about you, but I remember just a few short years ago that President Bush "...looked into Vladimir Putin's eyes..." and saw a soul he could trust. Wrong George. Old habits die hard and much like the UAE, Putin is only our friend to our face. Behind our back, however, he has gone out of his way to be un-helpful to the U.S.... joining France's efforts against us before the Iraq war, even going as far as to befriend Hammas and help Iran get nukes. Even a so-called Western ally like France actually hates America. Saudi Arabia is our supposed ally too, yet they are the world's largest exporter of terror. They teach radical islam in their schools and some members of their royal family were found to have financial links to terror. But they're "officially" our friends ... right. Hey, why don't we put the Saudis in charge of our airport security? Can you say 9/11? Is President Bush truly so naive as to think that the UAE can be trusted to protect our national security interests? Bush said that we have to be right 100% of the time and the terrorists only have to get lucky once. He was absolutely correct. This could be that "once". Just like he was wrong to trust Putin, Bush is wrong again regarding the UAE. And this time, I honestly fear I will live to see the day that our country realizes what a huge mistake we made by allowing our port security to be handled by a foreign country that doesn't like us. Why doesn't Bush get it? Even Hillary Clinton and most Democrats get that this is a dumb idea. Of course, Jimmy Carter agrees with Bush and thinks this deal will be okay ... that should be a MAJOR clue that we need to stop the deal immediately! Who'd a thought it would be a stupid Republican that pissed me off bad enough to finally start this blog! Thank you President Bush for motivating me...I'm proud to finally have my blog up. Unfortunately, I've never been so ashamed to be a Bush supporter as I am today.